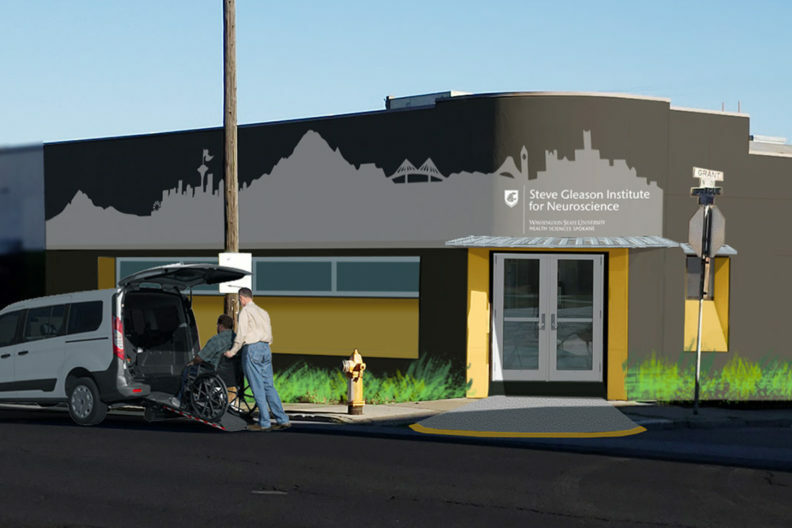 Architectural rendering of the front of the Steve Gleason Institute for Neuroscience, to be located at 325 E. Sprague Avenue. SPOKANE, Wash. – Washington State University Health Sciences Spokane and Team Gleason are proud to announce a collaboration to establish the Steve Gleason Institute for Neuroscience in Spokane’s University District. The institute will focus on innovative “care and cures” for brain diseases. This class of diseases includes Amyotrophic Lateral Sclerosis (ALS), Parkinson’s and other neurodegenerative diseases. Together, these conditions affect millions of Americans and account for billions of dollars in health care costs each year. Former WSU and NFL star Steve Gleason was diagnosed with ALS in 2011. He founded the nonprofit Team Gleason, and through his guidance, Team Gleason is the leader in developing and providing assistive equipment and technologies for people with ALS. The organization has partnered with leading tech giants, passed federal legislation, and opened a residence that is equipped with automation for up to 18 people living with the disease. Team Gleason continues to push the envelope on what is possible for people with ALS, neuromuscular injuries, and other degenerative conditions. WSU Health Sciences and Team Gleason are joined in this collaboration by community partners Avista, the Health Sciences & Services Authority of Spokane County (HSSA), Providence Health Care, St. Luke’s Rehabilitation Institute, MultiCare, the City of Spokane, and the University District. The Discovery Research Unit — including laboratories and shared facilities for scientists and support staff. The institute will be located initially in a building at 325 E. Sprague Avenue owned by Avista Development and leased by WSU Health Sciences Spokane. The location is at the south end of the new University District Gateway Bridge, expanding WSU’s mission of health education, research and care into what is expected to become a vibrant South Campus community in coming years. The Avista Foundation and HSSA have each contributed substantially toward the initiative. That initial sponsorship will allow for the hiring of key personnel and initiation of Institute activities as WSU takes steps to establish the Gleason Institute within the university structure. Fundraising is under way to expand operations, complete building renovations and launch research and patient‑care operations. WSU Health Sciences expects to bring additional partners into the project as it develops, ultimately building a world‑class institute that will make profound changes in the care and diagnosis and ultimately the treatments of brain diseases. The Gleason Institute is expected to open in the second half of 2019. See WSU News for additional information. The Steve Gleason Institute for Neuroscience is a research and care center focusing on discovery, care and cure for neurodegenerative diseases. Such diseases are caused by the cumulative death of brain cells, resulting in a loss of brain function. That includes amyotrophic lateral sclerosis (ALS), Parkinson’s and other diseases. The Discovery Research Unit with laboratories and shared facilities for scientists and support staff. WSU Health Sciences Spokane, Team Gleason, Avista, Health Sciences & Services Authority of Spokane County (HSSA), St. Luke’s Rehabilitation Institute, Providence Health Care, MultiCare, City of Spokane, and the University District. Team Gleason shares an interest in treating and curing neurodegenerative disease and has many established relationships with those who want to partner in building the institute. It will act as a convener for WSU and other partners. 325 E. Sprague Avenue, just south of WSU Health Sciences. The location is connected to the campus via the newly opened University District Gateway Bridge. Avista Development owns the building, and leases it to WSU’s Gleason Institute for a nominal fee. Both the Avista Foundation and HSSA were early backers of the initiative, contributing substantially to allow WSU to hire key personnel and initial establishment of the Institute’s activities. Fund‑raising is under way to expand operations, complete building renovations, and launch research and patient‑care operations. The institute will be funded by public and private donations. New assistive technologies to help patients living with neurodegenerative disease; new approaches to care; and meaningful research discoveries that could ultimately lead to cures. How does this fit in with research, treatment and care already offered in the area? The Gleason Institute recognizes the significant work already being done in the region by health care organizations and nonprofits that provide support to families and caregivers. Its aim is to offer a new center for collaboration and discovery, and to collaborate with organizations doing neurodegenerative disease health care and research. Are WSU Spokane students involved? It’s anticipated that the Gleason Institute will provide opportunities for health sciences students in the region to participate in its research and care work in the future. What kind of neuroscience research is WSU doing? WSU has research under way throughout its system on the causes and treatments of neurodegenerative disease. The formation of the Gleason Institute is expected to give those researchers new avenues to pursue their work in partnership with medical professionals, patients and caregivers. How will partners be involved? Some partners will collaborate on research or clinical trials at the Gleason Institute. Others will provide financial support to help create a new economic driver for the region’s innovation economy.